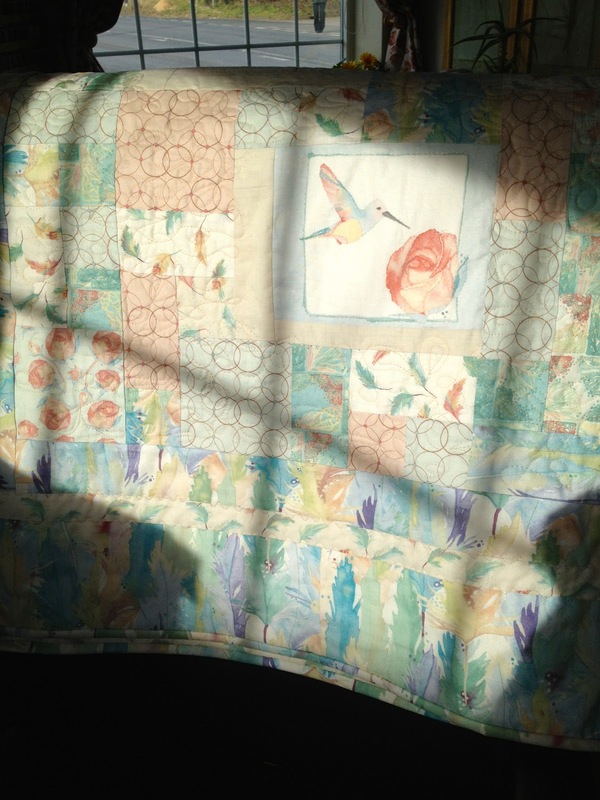 Elfin Patch: Finished Hummingbird Quilt. Scrumptious Quilt has had it's binding put on, for me that is the best part of making a quilt. It then went straight into the washing machine and is now blowing on the line in the garden. It's quite hard to photograph with the wind blowing. Quilt blowing on the line in the garden. When I came down this morning it was hanging over my chair in my sewing room. The sun was shining and I just had to take a photo, it looked so scrummy. ( there's that word again) but it really is. The builders have finished and we now have to decorate, hubby is doing the nasty bits ie- the ceilings and the woodwork. I have fun with the big roller on the walls. I will have to get back, (when all the decorating is finished) to the UFO I was doing before I went off at a tangent again, but who could resist that lovely fabric. Ha!